This story is about a single mother's fight for justice. 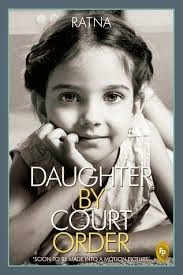 Ratna Vira’s debut novel, Daughter By Court Order, is a shocking, heart touching story of a girl called Arnie (Aranya is her full name) who grows up emotionally and physically abused by her celebrity mother. This is about her fight for justice. This story has some very ‘desi’ inspired characters such as Arnie’s great dadaji who had been a powerful CM and her phua Baby Singh. Throughout her life, it is dadaji and phua who protect her. Their traits and characterization are so well-structured that you feel as though you can see them right in front of you. At the beginning of the story, Arnie is a single, working mother to two children. She gets to know from her phua about an ongoing property dispute for the house she had grown up in. The case revolves around her dadaji's will. What seems like a straight forward case is a highly volatile one that requires a great legal strategy to navigate through. It is the first time I am reading an Indian novel that takes you into the heart of a protagonist whose mother hates the sight of her, leaves her out of the family tree and eventually goes to the extent of threatening her! Then, when the battle turns ugly, it is the protagonist’s friends, lawyers and ex-husband who help her to fight her influential, powerful mother. There is a clear departure from the usual ‘family’ formula in this novel. Instead, it mirrors the changing Indian society and relationships. It’s no longer ‘family’ that protects the daughter, it’s her closely cultivated networks that protect her today. Another positive spin pertains to a husband and wife, who divorced under very bitter circumstances, but help to fight each other’s battles without feeling attracted to one another. These are signs of mature adults in a fast maturing Indian society – we don’t see such responsible couples around us. This aspect, so well depicted in this novel, mirrors a noteworthy aspect about marital relationships in India. In most Indian novels that delve into legal disputes, the lawyers are shown as lazy, careless and manipulative people. This novel showed a balanced perspective – it showed lawyers who exploit, lawyers who avoid, lawyers who work according to the fee they get and lawyers who are confident enough of turning the odds by trying to separate the truth from the stacks of lies they have to wade through. It also appreciate the role of impartial, honest judges right from the lower court to the higher court. These tiny details make a big difference to the telling of a story. That sense of Arnie’s story ‘being real’ is what made me finish reading this book at one go. However, the author could have done a lot more to enhance the literary crafting of the book. It’s a plain, well-told, direct story. Repeated references to lyrics of favorite songs could have been avoided. There, you can sense, a rawness and a blurring to the art of telling a tale and writing a story. But we all love a good fight story against injustice and evil, don’t we? That’s exactly why you have to read Ratna Vira’s Daughter by Court Order! I like your choice of book reading, swapna. Will defintely pick it up. Btw, is this a real story or work of fiction? That sounds like a realistic enough portrayal of lawyers that the rest of the book looks like an interesting read. Along with the legal battles of the separated couple, who have to unite, to taken on their common enemy. NOt a very usual plotline so I think this book will do well.